With the exit of Russia from the war in 1917, Austria-Hungary was now able to devote significant forces to the Italian Front and to receive reinforcements from their German allies. The Austro-Hungarian emperor Karl had reached an agreement with the Germans to undertake a new offensive against Italy, a move supported by both the chief of the general staff Arz von Straussenberg and the commander of the South Tyrolean Army Group Conrad von Hx�tzendorf. In the autumn of 1917 at the Battles of Caporetto and Longarone the Germans and Austrians had defeated the Italians who fell back to the Piave River. 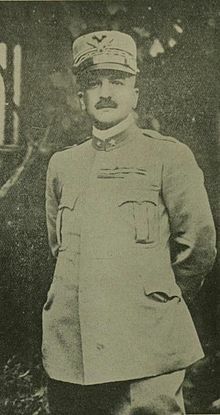 Italy's defeat at Caporetto led to General Luigi Cadorna's dismissal and General Armando Diaz replaced him as Chief of Staff of the Italian Army. Diaz set up a strong defense line along Piave River. Up until this point in the war, the Italian army had been fighting alone against the Central Powers; with the defeat at Caporetto, France and Britain sent reinforcements on the Italian front. These, apart for accounting for less than a tenth of the Italian forces in theater, had however to be redirected for the major part to the Western Front as soon as the German Spring Offensive began on March 1918. The Austro-Hungarian Army had also recently undergone a change in command, and the new Austrian Chief of Staff, Arthur Arz von Straussenburg, wished to finish off the Italians. Straussenberg's army group commanders, Franz Graf Conrad von Hx�tzendorf (the former Austrian Chief of Staff) and Svetozar Boroević von Bojna, both wished to make a decisive assault against the Italians, but could not agree about the location of the attack. Conrad wanted an attack from the South Tyrolean Alps towards the Asiago Plateau and Vicenza. Boroević first favored a defensive action, but then when pressed preferred a frontal attack along the Piave River. Straussenburg himself was in favour of an attack on the western part of the front (the "Giudicarie" sector) leading to Brescia. Conrad and Boroević had a dislike for each other, and Straussenburg and the emperor, unable to decide between these two strong personalities, divided the army equally between them, reserving only a small part of the forces for a diversionary action on the Giudicarie sector. The preparation of the offensive began in February 1918, after a meeting in Bolzano between the Austrian and German high commands. It was strongly recommended by the Germans, as Ludendorff hoped that it could force the increasing American forces in France to be diverted to the Italian front, so Straussenberg modeled the attack after Erich Ludendorff's offensive on the Western Front. The Austrians, differently from their previous success at Caporetto and from the subsequent attempts to breakthrough on Mount Grappa, did not prepare the attack as a pinpoint one, but as an all-out frontal attack, employing the entire residual strength of their army all along the front. The Austro-Hungarian formations were trained to employ the tactics developed by the Germans on the Western Front for the Operation Michael as Austrian officials, returning from the Eastern Front, were extensively trained alongside their German counterparts. There were also innovations on the Italian side. Analyzing the defeat of Caporetto, the staff of Armando Diaz concluded that the main tactical causes of it were the lack of mobility of Italian units, caught in a too rigid defensive scheme, the too centralized command and control system, and the lack of depth of Italian defences, where too many soldiers were simply stuck on the frontline. The new schemes prepared for the battle led to the abolition of the continuous entrenchment and in the development of a highly mobile defence system, in which even the smaller units were allowed to freely move between previously recognized strongpoints, independently decide to retreat or counterattack, or directly call the support of the artillery. Moreover, 13 divisions, equipped with 6000 trucks, were organized in a central reserve, ready to be sent where it was needed. General Diaz learned the exact timing of the Austrian attack: 3:00am on 15 June, so, at 2:30am, the Italian artillery opened fire all along their front, on the crowded enemy trenches, inflicting heavy casualties. In some sector the artillery barrage had the effect to delay or stop the attack, as Austrian soldiers began to revert to the defensive positions, believing to have to face an unexpected Italian attack, but on the great part of the frontline the Austrians still attacked. Boroević launched the first assault, moving South along the Adriatic Coast and in the middle course of the Piave River. The Austrians were able to cross the Piave and gained a bridgehead fifteen miles wide and five miles deep in the face of heavy resistance, before Boroević was finally stopped and forced to order a retreat. On the subsequent days Boroević renewed the assaults, but the artillery barrage destroyed many of the river's bridges and the Austrian formations that crossed the river were unable to receive reinforcement and supplies. To make matters worse, the swollen Piave isolated a great number of units on the west bank of the river, which made of them an easy target for the Italian fire. An estimated 20,000 Austro-Hungarian soldiers drowned while trying to reach the east bank. On 19 June Diaz counterattacked and hit Boroević in the flank inflicting heavy casualties. In the meantime Conrad attacked along the Italian lines west of Boroević, on the Asiago Plateau, on the 15th, with the objective of capturing Vicenza. His forces gained some ground but came upon stiff resistance by British and French units; 40,000 casualties were added to the Austrian total. In the aftermath, Boroević was particularly critical about the behaviour of Conrad who, after the complete failure of the first attack, preferred to continue the assaults in the subsequent days, but with diminished strength, rather than to send reinforcements to the Piave sector. Lacking supplies and facing attacks by armored units, the Austro-Hungarians were ordered to retreat by Emperor Karl, who had taken personal command, on June 20. By 23 June the Italians recaptured all territory on the southern bank of the Piave and the battle was over. After the Austrian retreat Diaz was pressed by the allies, particularly by General Ferdinand Foch, to press on and try an assault to break the Austrian defences and gain a decisive victory over the Empire, but the Italian General recognized that the same tactic, that proved so effective on defence, prevented an immediate offence, as the Italian formations, at that time, were too scattered and mixed up to be effectively coordinated in a decisive assault. Moreover, once the Italian Army crossed the river, they would have to face the same logistic problems as the Austrians. For these reasons, in the subsequent days, only limited actions were done, to gain better start positions for the future decisive assault. On the other side, the Battle of the Piave River was the last great military offensive of Austria-Hungary. Despite having taken some fifty thousand Entente prisoners, losses among the Austro-Hungarians were very heavy. A clear failure, the operation struck a major blow to the army's morale and cohesion and had political repercussions throughout war-weary Austria-Hungary.}} The battle signaled both the end of its army as an effective fighting force, and the beginning of the collapse of the Empire itself, which was finished off at the Battle of Vittorio Veneto, four months later. Still today, to the Italian public two mottos recall the battle: those written as graffiti upon broken walls of destroyed rural houses: "E' meglio vivere un giorno da leone che cent'anni da pecora" ("[It] is better to live one single day as a lion than a hundred years as a sheep") and "Tutti eroi! O il Piave o tutti accoppati" ("Everyone a hero! Either (we reach) the Piave, or let all of us get killed"). The two pieces of wall are preserved in the military shrine of Fagar� della Battaglia, a frazione of San Biagio di Callalta.